Miami Heat President Pat Riley has brought some heat to the real estate market. He and wife Christine purchased a unit in the Four Seasons Residences at the Surf Club in Surfside, FL, for $8.1 million, the Real Deal reported. While no photos are available of the Rileys’ unit, the fifth-floor condo they purchased has four bedrooms, five bathrooms, and 3,948 square feet, according to the listing. The Surf Club development, completed in 2017, was designed by architect Richard Meier and local architecture firm Kobi Karp. There are currently seven units in the development on the market, at prices ranging from $3.5 million to $18.5 million. Marketing materials for the private residences showcase floor-to-ceiling glass walls, up to 20-foot-high ceilings, and custom indoor-outdoor transitions to terraces that range up to 18 feet in depth. Frameless glass balcony railings on the terrace offer unobstructed views of the Atlantic. Finishes include travertine or wood flooring, Meier-designed master baths, and Boffi and Meier custom-designed kitchens with Corian counters, and Miele and Sub-Zero integrated appliances. Some of the high-end units feature their own swimming pools, courtyards, and outdoor showers and kitchens. The oceanfront project includes a 72-room hotel as well as two 12-story towers with 150 units, with upscale perks such as two pools, a gym, a health and wellness center, and a Thomas Keller restaurant. The basketball executive joins an exclusive list of residents at the Miami Beach towers attached to the luxury hotel, including former Esquire publisher Alan Greenberg, real estate developer Richard Ruben, and Groupon founder Eric Lefkofsky. The site includes the restored original Surfside beach club that dates to 1930 and boasted such high-profile guests as the Duke and Duchess of Windsor. 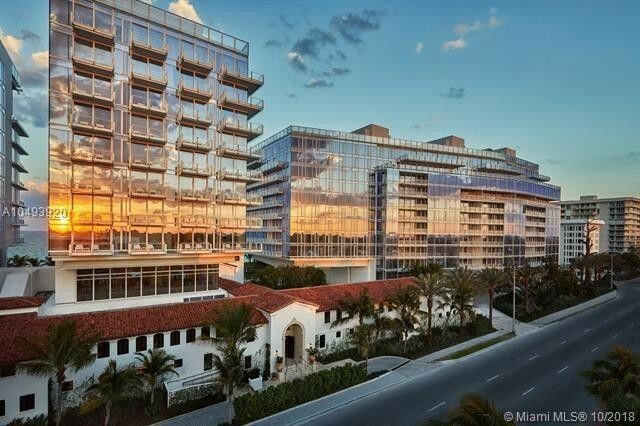 Now, with Riley’s purchase, the condo can also boast the addition of the “Godfather.” Riley is the president of the Miami Heat, and is considered one of the greatest NBA coaches of all time. The 73-year-old served as head coach for five championship teams.